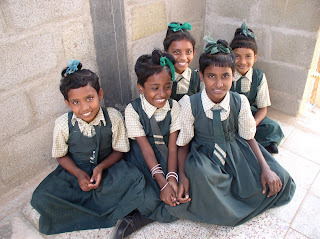 Almost ten years ago, I served on a team in India. I had just turned 18, barely graduated from high school, and headed overseas without a clue as to what I was doing. I still remember the day I heard about Global Volunteers on a morning talk show, and by that afternoon, I had decided on India simply by pointing to a spot on a globe and saying "that's the one." We were at the orphanage on 9/11. Since that time, I've earned a Master's degree in international relations and humanitarian development; served long-term in Thailand, Cambodia, Kenya and Uganda; and conducted significant research into the issues of human trafficking in Southeast Asia. I now coordinate a social business program that empowers others to solve world issues through enterprise and microfinace projects. My point in telling you all this is for you to know the ripple effect your work and organization has had on the world. When people ask how I've done so much at a young age, it always comes back to Global Volunteers. The spark was lit when I touched down in India, and has been burning brightly ever since. Thanks so much for what you've done for those who serve, and for those who are being served.